It wasn’t until two weeks ago while running errands and feeling famished, that I stopped into Starbucks to get some iced green tea when I spotted Kind Bars, a fruit and nut natural nutritional bar. Realizing that I didn’t have time to stop and grab a bite anywhere, I decided to try one. WOW! They were fantastic with just the right amount of fruits, nuts, chew and satisfaction. That little bar kept me full the rest of the afternoon. I was shocked! When I finally made it home my mission was to find a recipe for these. I searched online and viewed a variety of recipes and even tried them, but none had the right combination of ingredients to keep them held together. One claimed to be perfect and others had testified, but it hadBrown Rice Syrup in it, an ingredient I recently wrote about. So decided not to try this version. 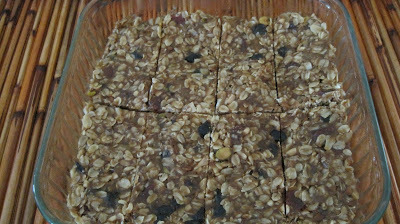 Besides loving the flavor my main goal was to find a granola-like or nutrition bar that I could make to take while biking or hiking through the mountains where I’ll be soon. Typically I go on 3-4 hour bike rides and 4-5 hour hikes, so a nutritional bar is the perfect fix for a tired, hungry body in the middle of the mountains. At $4+ a pop for a bar I’d prefer making my own, that is, if it’s not going to take all day. just didn’t hold together well. The second batch I made, I added oats, 7-whole grain cereal and peanut butter, subbing out honey for Lyle’s Golden Syrup.. This one turned out perfect. If you’re a fan of peanut butter, I think you’ll like this. Next time I’m going to try it with Lyle’s Golden Syrup, a favorite of mine. In addition, I chopped the nuts rather than leaving them whole, which only made it easier to slice but IMO looks prettier left in one piece. I hope you like this quick, easy, tasty and nutritious bar. It’s a perfect snack when you’re on the run! 1. Preheat the oven to 350°F. Combine oats, seeds, and nuts. Spread onto a foil lined sheet pan, and bake until golden, about 10 to 12 minutes. Set aside. 2. In a large saucepan bring water to a boil, then remove from the heat. Add the Kashi cereal letting it absorb the water, about 5 minutes. Stir in peanut butter and honey, returning saucepan back to the stove on a medium-low heat. Stir constantly until the mixture thickens and pulls away from the sides, about 2 minutes. 3. Add the fruit, oats, seeds and nuts into the peanut-butter mixture, blending all together with a rubber or silicone spatula, until ingredients are evenly coated. 4. Grease an 8×8-inch baking pan with non-stick spray. Pour the mixture into the pan, and using your spatula, press into a uniform thickness. 5. Cover and move the pan to the refrigerator to chill for at least two hours. 6. Cut into 8 equal sized bars. Wrap individually in wax paper, tied with twine for traveling or enjoy straight from the refrigerator. These bars will keep at room temperature for 2 days, or refrigerated for up to 4 days. Note: Remember this is simply a blueprint of a recipe that worked for me. Now you can tweak this recipe to suit your taste, or allergies, and make your own unique bar. Please share your results. I’d love to hear them. I think it tastes great and of course you can tweak it anyway you like. I do like the Kind Bars and I’m sure if on the run and need a quick pick-me-up these will be great. For the cost and flavor you just can’t beat homemade. I have never tried a Kind bar but I would like to now! I would much rather make it home made though so thank you for working out that recipe! They carry Kind Bars at Starbucks and they are very tasty. They come in a variety of flavors. I hope you’ll try the recipe. 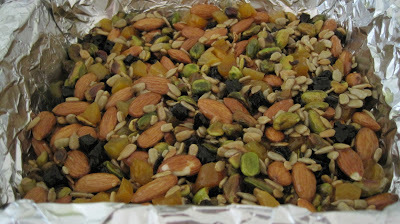 Add whatever nuts and dried fruits you like best to suit your tastes. Love these energy bars. I sometimes added some maple syrup to it and it holds great too. I love maple syrup. I’m sure that would be a nice addition. The ones I made here have honey in them and taste wonderful, however, I love Lyle’s Golden Syrup, so I think next time I will try that. These sound wonderful Vicki! Looks like you came up with the perfect mix! Thanks for sharing, my kids will love these – me too! I know I love them. In fact I haven’t been able to stop eating them. I’m going to have to start rationing them to myself. These look crunch-a-licious and so wonderfully hearty. Perfect for any post-workout refueling. Thank you Carolyn, they definitely keep you satisfied for hours. I agree, that’s the best part of cooking – reinventing a dish all over again. Kind Bar at Starbucks? I’ve never paid attention before. I love healthy bars – make me feel better about snacking, and my tummy will not complain that it’s hungry again. I love your recipe and will keep it for now but can’t wait to make it soon in the near future. If you try it please let me know. I’d love to hear your comments. These look nice and easy to make. 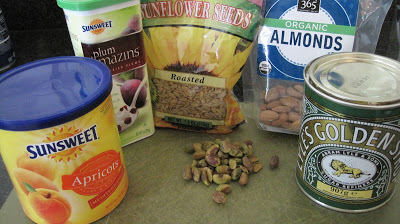 I love nuts and seeds, the more the better! This is a great combination! Thank you, I appreciate your comments. Feel free to tweak the recipe adding or deleting ingredients to suit your taste. They should have an ingredient list by each item they serve. Check it out and then create one similar, the same or even better. I used to bike a lot, but haven’t done much at all the last few years – definitely need to get back into it. And nutritional bars are so handy, yet many are so (how shall I say this?) weird, for lack of a better term. It’d be nice to know what goes into them. Great idea, and nicely done – thanks. It’s true, sometimes you look at the ingredient list and can’t even pronounce most of the names. If that’s the case it’s best to put it back. At least IMO! Thanks Mary. I hope you enjoy them if you make them. It’s amazing how time flies. My youngest just graduated. Now we all start new chapters in our lives! 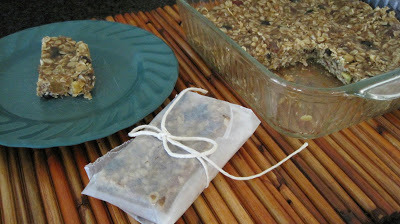 I’m a huge fan of making my own granola and I really need to try making nutrition bars like these next. Everything sounds delicious in them! This looks like a healthy winning combination. Thank you for stopping by. They were delicious and Gobbled up fast.